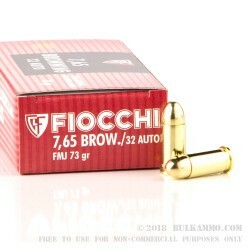 Fiocchi .32 ACP FMJ ammo in this bulk offering is about as good as it gets for the high volume shooter. Whether you’re out plinking for the day or you’re looking to log some serious trigger time at the range, you won’t go wrong with this setup. 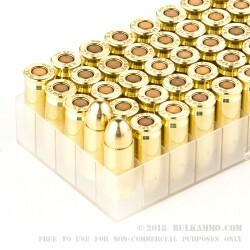 Fiocchi ammo is new production, non-corrosive, and boasts reloadable brass cases. 1,000 round cases ship as twenty 50-round boxes so you can bring as many as you need with you on your next range trip. Loaded with reliably feeding 73 grain full metal jacket projectiles, this 32 ACP ammo is ideal for range training. 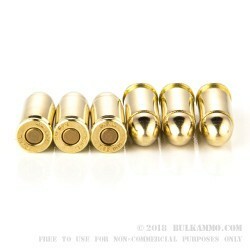 The full metal jacket projectile is designed not to expand upon impact, so you’ll likely not want to use these for self-defense. They can however, make an awesome training round at a fraction of the price of more sophisticated projectiles. Founded in the early 1800s, Fiocchi has manufacturing operations in Italy and in Southern Missouri. 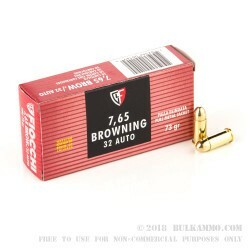 Their pistol ammo is known well by most American civilian shooters as an excellent choice for training and self-defense. Great stuff for practicing with. Q: I have a Winchester 1873 32 - would it use this ammo, or is there some .32 rifle ammo that I just can't find anywhere? A: Your 1873 Winchester is most likely chambered in .32-20. This cartridge is similar in size to (but not interchangeable with) .30-30 and is definitely not the same as .32 ACP or .32 S&W Long. It is possible that your rifle has been modified since it was manufactured, and having it checked/inspected by a gunsmith prior to shooting it would be recommended.